We hear so often about a songwriter knocking out a song in just a matter of minutes and this week’s choice is no exception. 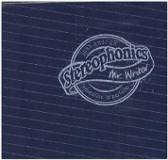 Kelly Jones of the Stereophonics said of Mr Writer, “It took me 10 minutes to write and 10 years to explain.” He’s probably learned a lesson from it. It all began in 1986 when singer/guitarist Kelly Jones and drummer Stuart Cable heard each other practising as they lived a few doors apart on the same street in Cwmaman in South Wales. Jones’ father used to be in a band called Oscar and the Kingfishers in the sixties who once supported Roy Orbison and that’s why Cable told Jones he should be a singer. They brought in a bass and keyboard player, called themselves Zephyr and recorded a couple of demos. Due to a couple of silly incidents the band split up, but a chance sighting by Jones who was on a bus and Cable who was at the bus stop, they reconnected and decided to give it another go. In 1992, having changed their name from Tragic Love Company to Stereophonics after Cable spotted a gramophone called the Falcon Stereophonic, they got themselves a manager called John Brand and signed with V2 records. The line-up now comprising Jones, Cable and bass player Richard Jones (no relation). Each of their first five hits did better than the previous one, but by the sixth hit, The Bartender and the Thief, they began regularly hitting the top 10. In 2000 they teamed up with Tom Jones for the number four hit Mama Told Me Not to Come, a song first recorded by the Animals in 1966. Their next hit was Mr Writer, a song written about a journalist who had become friendly with the band and been on part of a tour with them, but then wrote a couple of unsavoury items that Kelly didn’t like. He was upset because they had partied together, had some drinks together and then this happened. “It’s just a song about a couple of people that have been around me, really,” Kelly told the Metro in April 2001 “It’s supposed to be a bit of a sarcastic song but, judging from some of the reviews, it seems some people didn’t really get it. I think the fuss about it from some members of the press has been blown out of proportion.” He recalled in the NME in 2010, “Our relationship with NME started favourably, we were on the front cover all the time. Then a few journalists came on the road, but wrote a different version of events and we got pissed off. In a gnarly way we wrote a narky song called Mr Writer and things have been a bit frosty ever since. I wrote one comment about one guy and it turned into a shitstorm. The pen is mightier than the sword. Well, it was. Now the blog is mightier than the sword.” Because Kelly wasn’t specific about who the scribe was, every journalist thought it was about them. In 2002 Cable was given his own television chat show, but the band weren’t happy as he wasn’t turning up for rehearsals and they eventually sacked him. He was given another show the following year and also became a presenter on BBC Wales. He fell out with Kelly again, but patched things up in 2009. On 7th June 2010, Cable finished his radio show that weekend and he was drinking in a pub in Trecynon then went home to continue drinking. He went to bed but choked on his own vomit during his sleep and died, he was just 40. The band continued to released singles and albums and finally got their first number one single with Dakota in March 2005. It also proved to be their last top 10 hit single despite a further 10 years of releases. Their last album, however, Keep the Village Alive in 2015 did make number one.